How to repair an inflatable boat or raft. Other inflatable sealants turn brown and crack shortening the life of your repair and staining your boat. ToobSeal® dries clear and stays flexible. ToobSeal® shown on the left and another sealant on the right. 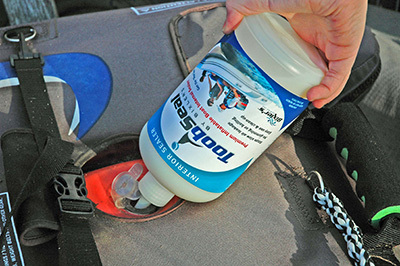 ToobSeal dries clear and stays flexible (test fabric is white Hypalon®). A close up of the other sealant. Inject 1 quart (32 oz) ToobSeal® liquid sealer equally into all the air chambers. Shift the boat side to side and bow to stern at a 45 degree angle until the sealer has circulated and coated all inner surfaces of the boat. The Sealer has the consistency of water so ToobSeal is easy to apply. No. Toobseal® is a acrylic based formula which is not flammable or considered hazardous.